This post is based on an adult Sunday school lesson that I taught at Riveroaks Reformed Presbyterian Church in Germantown, TN on June 14, 2015. It seems that most discussions on Christian apologetics these days have focused on two major schools of thought: classical and presuppositional. The classical folks trace their lineage back to Thomas Aquinas (13th c. AD), up to present-day theologians like R.C. Sproul and William Lane Craig. The presuppositionalists, representing a large segment of the Reformed world, look back to men like Cornelius Van Til and Greg Bahnsen (20th c.), as well as present-day representatives like K. Scott Oliphint and John Frame. The classical school teaches that, by making right use of the self-evident first principles of reason, anyone can in theory arrive at a (non-saving) knowledge of God. This is essentially the task of natural theology. But presuppositionalists tend to be much more skeptical of the value of natural theology. Highlighting the noetic effects of sin, they believe that objective knowledge is an impossibility. Everyone interprets evidence through the lens of their own prior worldview commitments. Bias is inevitable, which means that there is no guarantee that unbelievers can arrive at a true (non-saving) knowledge of God via reason alone (though this may happen sometimes). So for the presuppositionalist, faith in the Triune God must lie at the beginning of human reasoning, not just at the end. In his book Desiring the Kingdom (Baker, 2009), James K.A. Smith examines the view of humanity underlying each of these three approaches (pp. 40-63). He says that in the classical approach (which he calls “bobblehead Christianity”), the human person is regarded as primarily a thinker, a brain on a stick. This view is highly cognitivist and tends to downplay the role of cultural and personal prejudices in human reasoning. Presuppositionalists, Smith argues, get us closer to the mark. They see the human person as primarily a believer, for whom the task of knowing always already begins with faith commitments. But Smith finds fault with presuppositionalism for being too cognitivist as well. It simply takes us one step down from the level of ideas to that of beliefs, but in either case we are essentially dealing with intellectual propositions. It would seem as though our emotions, our bodies, and our communities never factor into the equation. By contrast, Smith’s own view borrows from the thought of Saint Augustine, who taught that the human person is not primarily a thinker or a believer, but rather a lover. Augustine recognized that at the core of our being we find not ideas or beliefs, but desires. Our heads are inextricably tied to our hearts. Smith builds on this principle, arguing that our deepest convictions result from habituation to a particular vision of human flourishing or “the good life.” It is such a vision, fostered through our cultural “liturgies” (practices invested with ultimate, identity-forming significance), that captures our imaginations and guides our reasoning. Now Smith’s interest isn’t with apologetics per se, but rather with Christian education and discipleship. However, I think that his portrait of human nature fits nicely with an existential approach to apologetics. If we are fundamentally desiring, imagining animals, then it follows that the most effective means of winning unbelievers to Christ is through their imaginations, persuading them that Christianity satisfies our deepest needs. It has to be felt by many (or most) people; otherwise it is just a preference. It has to be enduring (persisting through time); otherwise it is just a whim. It has to be significant, not trivial or superficial. It has to be connected to a constellation of other needs, not isolated or peripheral. It has to be felt strongly (at least by some people some of the time), not something that we can take or leave with indifference. Using these criteria, Williams distinguishes between “self-directed” needs and “other-directed” needs (pp. 23-27). Among our self-directed needs are cosmic security, life beyond the grave, heaven, goodness, a larger life, being loved, meaning, and forgiveness. Our other-directed needs—those which don’t necessarily benefit ourselves personally but are still felt deeply and universally—would include loving others, awe, delighting in goodness, being present with whose we love, and justice/fairness. Thirteen needs in total, but the list is not meant to be taken as exhaustive. Williams points out that this statement by Lewis is more of an evidential argument—a demonstration that the very existence of some desire requires an explanation—than an existential argument. The difference between the two sorts of arguments is that, while an evidential argument is concerned to demonstrate that Christianity is true, an existential argument is merely intended to show that Christian faith is justified. Perhaps a clearer example of an existential argument in Lewis’s writings is found in The Silver Chair, the penultimate book in the Chronicles of Narnia series (it’s no coincidence that the argument should be expressed in a fictional narrative rather than in a theology essay). In this story, two classmates Jill and Eustace cross over to Narnia, embarking on a quest to find the kidnapped Prince Rillian. During their quest, they are accompanied by the Marsh-wiggle Puddleglum. Their journey takes them into a subterranean kingdom called Underland, completely cut off from Narnia above. Crossing over the Sunless Sea, the trio is brought to a city ruled by the Lady of the Green Kirtle, where they first meet her protégé, a young man who confesses to experiencing nightly psychotic episodes. Each night he must be bound in a silver chair, or else he will turn into a deadly serpent (supposedly the very serpent that had killed Rillian’s queen mother). As night approaches, the trio bind the young man in his chair, and the psychosis begins to overtake him. He begs and pleads with them to be released, but they stand back, until he begs them to release him in the name of Aslan. This was the sign that Aslan had previously foretold to Jill. The trio thus release the young man despite their hesitation, and discover that he is none other than Prince Rillian. He had been under the witch’s spell all along, forgetting his true identity. You see? When you try to think out clearly what this sun must be, you cannot tell me. You can only tell me it is like the lamp. Your sun is a dream; and there is nothing in that dream that was not copied from the lamp. The lamp is the real thing; the sun is but a tale, a children’s story. Suppose we have only dreamed, or made up, all those things—trees and grass and sun and moon and stars and Aslan himself. Suppose we have. Then all I can say is that, in that case, the made-up things seem a good deal more important than the real ones. Suppose this black pit of a kingdom of yours is the only world. Well, it strikes me as a pretty poor one. And that’s a funny thing, when you come to think of it. We’re just four babies making up a game, if you’re right. But four babies playing a game can make a play-world that licks your real world hollow. That’s why I’m going to stand by the play-world. I’m on Aslan’s side even if there isn’t any Aslan to lead it. I’m going to live as like a Narnian as I can even if there isn’t any Narnia. Notice that Puddleglum’s argument doesn’t prove the truth of Christianity (or in this case, Narnia). But it does show that we ought to believe in it nevertheless, seeing how it far outstrips and out-satisfies the life we now live. Such an argument will leave the rationalistic side of our nature disappointed, but there is something ineffably persuasive about it. Perhaps Blaise Pascal put it best when he said, “The heart has its reasons of which reason knows nothing.” We should certainly be concerned with the propositional truth of Christianity, but we should also be mindful that much of the persuasive power of Christianity comes from something that transcends propositions and formulaic expressions. We should believe the gospel because it is beautiful. The three approaches fit John Frame’s tri-perspectivalism: classical apologetics, with its focus on evidence and proofs, represents the situational perspective; presuppositionalism, with its focus on Scripture as the norm for all human thought, represents the normative perspective; and existential apologetics of course represents the existential perspective. Sigmund Freud was right to call religion a projection of our longing for cosmic security. Where he went wrong was in assuming that this longing must be pathological. What if we were hardwired that way by God himself in order to seek him out (cf. Acts 17:27)? I get this illustration from Rachel Bomberger’s review of James K.A. Smith’s How (Not) to Be Secular. 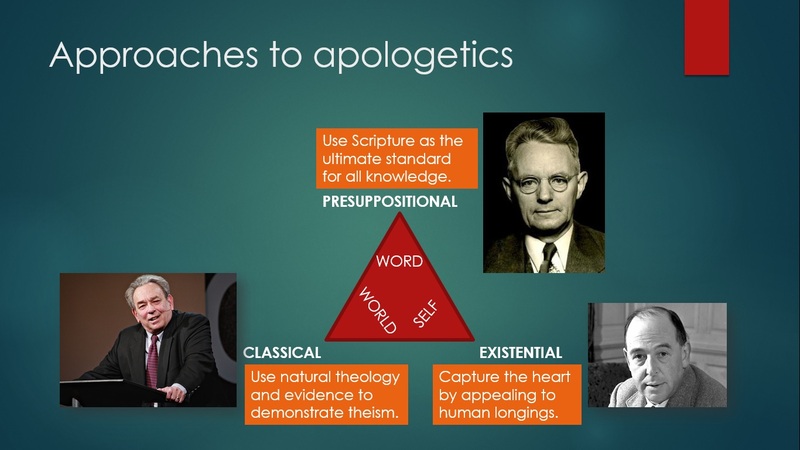 The classical approach to apologetics includes the existential. Moral arguments address one particular type of existential longing, namely, a search for a basis for moral values and a hope for ultimate justice, and those have been staples of classical apologetics for a long time. The Thomist scholar W. Norris Clarke defends a two-fold natural theology that consists of the “outer way,” i.e., appeals to the existence and order of the universe external to me, and the “inner way,” i.e., appeals to God as the best explanation of the origin and nature of our inner world, e.g., reason, consciousness, moral values/conscience, longings for love, etc. Any approach to apologetics that develops and presents arguments that begin with data of our experience in the world (both the outer and inner way) and reasons from that data to the existence and nature of God is a form of classical apologetics. I think Lewis is an excellent exemplar of classical apologetics, even if he does focus more on the inner way rather than the outer way (which one would expect from a literature professor). It sounds like your example on the “inner way” is more an evidential argument from desire than an existential argument (see my comments on the Mere Christianity quote in the post). Williams explains this in fuller detail, but the gist is that an existential argument in the proper sense is not an argument from the existence of desire to a theistic explanation. Rather, it is the claim that Christian faith is justified simply because it satisfies our desires (regardless of its truth value). I don’t think this falls into the classical approach, but is complementary to it. For Williams, the clue to look for in distinguishing an existential argument from an evidential argument is to ask, does it attempt to give an *explanation*? An existential argument does not, but an evidential argument does. I don’t see a very clear or sharp distinction between the two, and I guess it depends on what counts as an “explanation” and what you mean by “justified.” Do you mean “rationally justified,” i.e.,the Christian faith’s satisfying my desires means that I am within my epistemic rights to believe its claims about reality? Puddleglum is still making an _argument_ that invites us to reflect rationally upon our desires and assess the adequacy of a proposed solution that satisfies those desires. I think that that can be cast as a version of an evidential argument. The Lady’s explanation of the cave and the images in the minds of Puddleglum and his companions prompts him to reflect upon the nature of his desires, and he concludes that her explanation does not adequately satisfy them (it is a “poor” world). He reasons from the nature of his desires to conclude that the Lady’s explanation is not credible (able to be believed) while the “Aslan theory” is credible. The hidden premise is that whatever best satisfies my desires is also the most rational object of my belief. And unless I make the further claim that there is no connection between human rationality and ontological reality, then it seems that Puddleglum’s argument is an argument for the reality of God as the satisfaction of my desires and my reason (because it is rationally more credible and justifiable than competing naturalistic explanations). In other words, an argument that rationally analyzes and identifies the best and most rational source of the satisfaction of my desires just is a type of rational explanation of those desires.